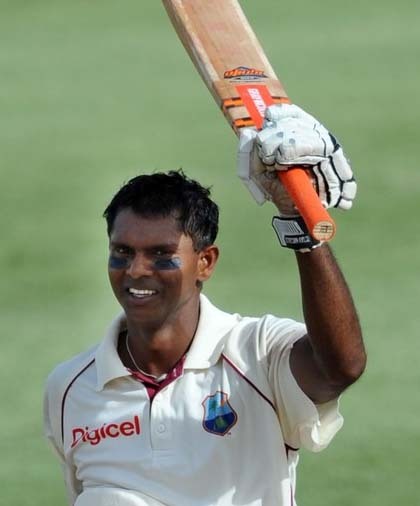 Veteran West Indies batsman Shivnarine ‘Tiger’ Chanderpaul rolled back the years on Sunday as he stroked a world class century to help the Guyana Jaguars rescue a draw against the Leeward Islands Hurricanes in the third round clash of the Cricket West Indies Regional 4Day competition. The Defending Champions Jaguars won the toss and asked the Hurricanes to take first strike and was made to toil on that opening day with the hurricanes posting 183-1 with Monticin Hodge and Kacey Carty both passing the half century mark. On day two however the Hurricanes upped their scoring tempo as they posted 412-9 declared with Hodge making 91 and Carty making 83. The Hurricanes also received half centuries from Jahmar Hamilton and Terrence Warde. In the final hour on Day 2 however the Jaguars found themselves in a mess of trouble after they were restricted to 53-6 and 359 runs behind. Warde then stole the show on Day 3 collecting four wickets for 48 runs from ten overs as the visitors were bowler out for 206. Hurricanes captain Rakeem Cornwall asked the Jaguars to follow-on and the team got early rewards capturing the two Guyanese opening batsmen TagenarineChanderpaul and ChanderpaulHemraj late on Day three leaving the two time champions on 42-2. On the final day the Hurricanes quickly removed night-watchman VeerasammyPermaul that brought the veteran Chanderpaul to the crease to join Vishaul Singh. Following a troublesome period from both batsmen facing the spin twins of Cornwall and Warde, the 43 year oldChanderpaul found his groove and along with Singh put the bowlers to the sword. Singh was eventually removed for 35 leaving the Jaguars 143-5 and gave the home side a glimmer of hope they can still keep the visitors under the follow on lead. However the level headed Chanderpaul tore into the Hurricanes bowlers as they took the second new ball and he and Anthony Bramble put on 122 for the seventh wicket as they frustrated the Hurricanes who eventually lost the enthusiasm the team had in the earlier stages of the innings. Chanderpaul stroked 109 from 147 deliveries and when he was removed by Warde gave the Hurricanes hope that they could still salvage an outright victory, but Bramble continued to frustrate and saw the team safely to a draw. Speaking following the game Hurricanes head coach Winston Benjamin praised his team for their credible performance. He also commented on conditions his team had to battle through. Benjamin also noted that the team has to work on improving their fielding going forward. Next up for the Hurricanes will be Jamaica Scorpions at Warner Park this weekend.